For Rod Mengham sculpture and painting exist in the world the way poems do. He invokes the Polish sculptor Katarzyna Kobro, who believes that sculpture must be understood as part of the world around it. In Chance of a Storm, poetry is language that comes trailing bits of other forms of speech and writing. 'Poems should be finished, but be still hot to the touch, giving a vivid sense of the thinking and feeling that went into their creation,' he says. Drew Milne speaks of the poems' 'beautiful, belligerent laconicism'. While the lyric is central to Mengham's work, it cannot shrug off the ambition of epic, scaled down but still latent. This telescoping informs the structure of these prose poems, a species of modernist fable. 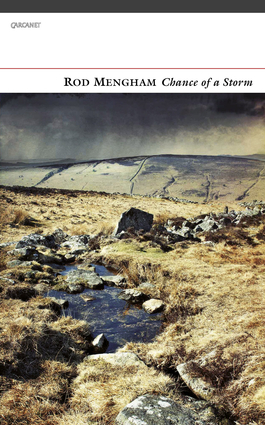 Rod Mengham lives and works in Cambridge. He has written books on Henry Green, Emily Bronte, Charles Dickens, Thomas Hardy and on language and cultural history. He is the editor of the Equipage series of poetry pamphlets. His poems have been published in Unsung: New and Selected Poems and with photographs by Marc Atkins in Parleys and Skirmishes and Still Moving.